»E-News»Enjoy Harvest festivities at the 2013 Johnny Cake Festival! Enjoy Harvest festivities at the 2013 Johnny Cake Festival! 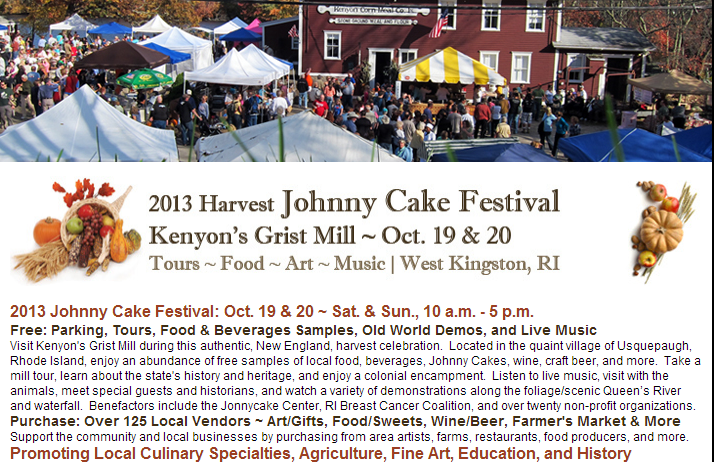 Get out and enjoy the fall foliage, enjoy live music, eat drink and be merry at the 2013 Johnny Cake Festival this weekend at Kenyon’s Grist Mill in West Kingston, RI. Click here for the Festival Website.